Since his journey on the Beagle, Darwin has considered two major theories that accounted for the evolution of species. Natural Selection was described as the result of competition within or between species affecting its individuals relative survival ability, a definition that has stood the test of time. Since his publication of On the origin of Species through Natural Selection, this theory has found great acceptance in the scientific community. Sexual Selection was described as the result of competition within species affecting its individuals relative rate of reproduction. This theory emerged from Darwin’s necessity to explain complex ornamentation and courtship behavior in animals which are costly to maintain and apparently offer no survival advantages. Unlike the theory of Natural Selection and despite his attempts, Darwin’s theory of Sexual Selection was not well received by the scientific community, resulting on its long term oblivion, which lasted for over a century. This indifference has had a strong effect on the theory of evolution, promoting the theory of Natural Selection as the only major player in evolution. Other theories to explain animal ornamentation and courtship behavior were developed, riding piggyback on Natural Selection. The theory of Sexual Selection was barely kept alive during its period of oblivion by a small number of supporters such as Fisher. It was not until the 1970s, through the work of Zahavi and a second edition of Fisher’s work, that research on Sexual Selection reemerged. At this time, the scientific community was more open minded, better equipped and prepared to understand the concepts and mathematics behind Sexual Selection, which was finally able to attract the attention of a large number of researchers. Boosted by the emergence of new fields of research such as Evolutionary Psychology and Evolutionary Anthropology, the theory of Sexual Selection gradually reached a high level of acceptance, with plenty of new publications and evidence being added to that provided by Darwin. While different ideas regarding its relation with Natural Selection emerged, Sexual Selection is nowadays highly regarded in many research fields as a major force in the evolution theory, a force capable of shaping highly complex traits and behaviors. Despite the ongoing increase in interest and research on the subject, Sexual Selection has yet to find its place in Evolutionary Computation (EC), a research field that emerged during the period when Sexual Selection was overlooked. By the time it reemerged, various Evolutionary Algorithms (EA) had already established themselves following the ideas that were popular from the 1950s to the 1970s, being therefore greatly inspired by the theory of Natural Selection. Despite the publication of a few articles on Sexual Selection in EC, the subject, as of yet, has failed to attract the attention of the research community, remaining in a blind spot. The success it has had on other research fields and the importance it has proven to have in the evolution theory are however a great motivation to study what effects Sexual Selection may have on the performance of Evolutionary Algorithms. Darwin introduced two main processes in Sexual Selection. Male Competition promotes the evolution of characteristics for males to fight others for access to females. Female Mate Choice promotes the development of male characteristics for attracting females for reproduction. Darwin’s research focused specially on the latter as did most of the researchers that have addressed the subject since the reemergence of the theory of Sexual Selection. While male competition may be inherent in some experiments, our focus remains on Sexual Selection through Mate Choice, its behaviors and effects on the evolutionary process. Our working hypothesis is that Sexual Selection through Mate Choice may be used to enhance the performance of Evolutionary Algorithms on various contexts. 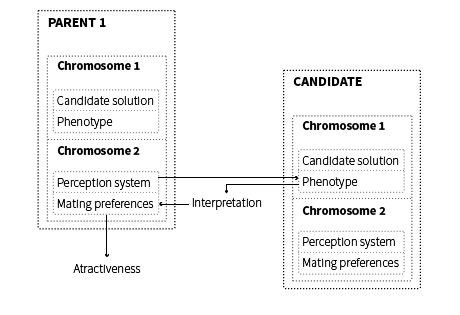 In order to assess this hypothesis we feel that a number of research questions should be addressed: what problems is Sexual Selection worth applying to; what are good design choices; what are the advantages or disadvantages of using Genetic Algorithms (GA) or Genetic Programming (GP) to model mate selection; what are the effects of different parameters on the evolution of mate selection; does using problem specific knowledge to model mating preferences influence its performance; how does Sexual Selection through Mate Choice influence diversity handling, speed of convergence, speciation or escaping of local optima; are there advantages in using gender determination; is there any relation between the observed behaviors and theorems such as Fisher’s runaway Sexual Selection or Zahavi’s handicap principle; is the resulting overhead worth it. A. Leitão, J. C. Neves, and P. Machado, “A self-adaptive Mate Choice model for Symbolic Regression,” in IEEE Congress on Evolutionary Computation, 2013, pp. 8-15. A. Leitão and P. Machado, “Self-adaptive mate choice for cluster geometry optimization,” in Genetic and Evolutionary Computation Conference, GECCO ’13, Amsterdam, The Netherlands, July 6-10, 2013, 2013, pp. 957-964. A. Leitão, F. B. Pereira, and P. Machado, “Enhancing cluster geometry optimization with Island Models,” in Proceedings of the IEEE Congress on Evolutionary Computation, CEC 2012, Brisbane, Australia, June 10-15, 2012, 2012, pp. 1-8. P. Machado and A. Leitão, “Evolving Fitness Functions for Mating Selection,” in Genetic Programming – 14th European Conference, EuroGP 2011, Torino, Italy, April 27-29, 2011. Proceedings, 2011, pp. 227-238.